After reviewing premium priced devices like the Microsoft Surface Studio and Wacom MobileStudio Pro in the last couple of months, it was almost a relief to take the opportunity to review a $400 tablet. Ordinarily my expectations for such a bargain-priced device would be low, but I’d already been positively impressed by the two previous generations of tablets from Chinese manufacturer Shenzhen Alldo Cube, the Cube i7 Stylus and the Cube i7 Book. The company’s latest release is called the Cube Mix Plus and the 10.6-inch tablet also happens to be the first Kaby Lake equipped device that I’ve had a chance to test. The Mix Plus is now white on silver and the front edges of the tablet are chamfered to make a much more elegant first impression than previous generations, which were cobalt blue. Though its coloring has changed, its physical ports and dimensions haven’t. Proof of this is the MP’s compatibility with the keyboard cover of the Cube i7 Book. The Mix Plus’ keyboard cover is featured in most product photos, but is sold separately. Unfortunately it’s not available to purchase anywhere at the time of this writing. A Mix Plus pen is also missing in action, but any Wacom EMR compatible tablet PC pen will work with it. The MP has a screen protector film pre-installed on the tablet that creates a slightly tacky grip to both the fingertips and softer nibs. I recommend using hard (white) nibs sold by Wacom for the Bamboo Stylus Feel. As I found on the Cube i7 Book, which was also sourced via GearBest.com, the Mix Plus arrived with a Cube user account already setup. To avoid any doubt, I did a complete PC Reset immediately. This process took about an hour, but I was then able to set up the device with my Microsoft ID. I hit an additional snag at that point because I couldn’t invoke the touch keyboard during setup (I didn’t think to try attaching the Book’s keyboard at that moment). So I finished setup with a local user account and then replaced it with my Microsoft account. After that, it was all smooth sailing as I installed all the available Windows updates. The generic nature of the Cube tablets is actually a positive, because I’ve yet to find any manufacturer-supplied driver support. Among the first things I did was to download and update all its Intel drivers. Video drivers are where most hardware manufacturers lock down their devices and as a result, you’re forced to run several versions behind the GPU makers’ latest and greatest. Besides its price, the biggest appeal to of the Cube line is their old school Wacom EMR pen support with 1024 pressure levels and the Mix Plus did not disappoint. I was pleased to find that the device was calibrated perfectly out of the box, with excellent edge accuracy. The Wacom Feel driver is pre-installed and can be upgraded to the latest version. I’m tempted to remove the screen protector because I somehow managed to mar it with a lot of superficial scratches within a day of use. However I’m not certain the film can be lifted without leaving significant residue. I’ve tried to pick lightly at the screen protector’s corners, but it’s held down very firmly. Speaker grills are located along the right side of the tablet. The left side includes a headphone jack, TF card slot, USB Type C and USB 3.0 ports and a power input. A power supply and USB 3.0 adapter cable are included. The Mix Plus is fanless and runs absolutely silently. 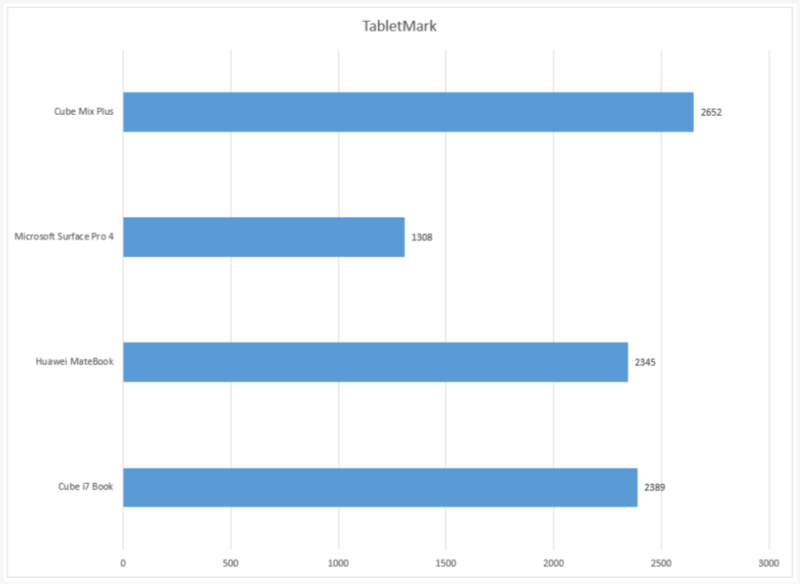 While performing intensive operations like benchmarking, the left side of the tablet got very warm. Perhaps because the tablet features a relatively new seventh generation (Kaby Lake) Core M3-7Y30 processor with Intel HD Graphics 615, Futuremark benchmarks reported that the GPU was not yet recognized. This probably explains why the Mix Plus scored so poorly in 3DMark's Ice Storm benchmarks, where it underperformed all my other m3 tablets. However, in all other benchmarks, the Mix Plus blew past those other devices, especially the Surface Pro 4. I have no answer for why the m3 SP4 is such a laggard in benchmarks. It might be that its higher resolution is pushing the integrated graphics harder than it should. The Cube Mix Plus handily outperformed sixth generation M3 tablets I tested, except in a couple of 3D Mark Ice Storm tests. It's likely that an unrecognized video card or driver is to blame for that poor result. Maybe the smaller screen and HD resolution of the Mix Plus gives it an unfair advantage, but it seems to me that a low end device has no business performing as well as it does. 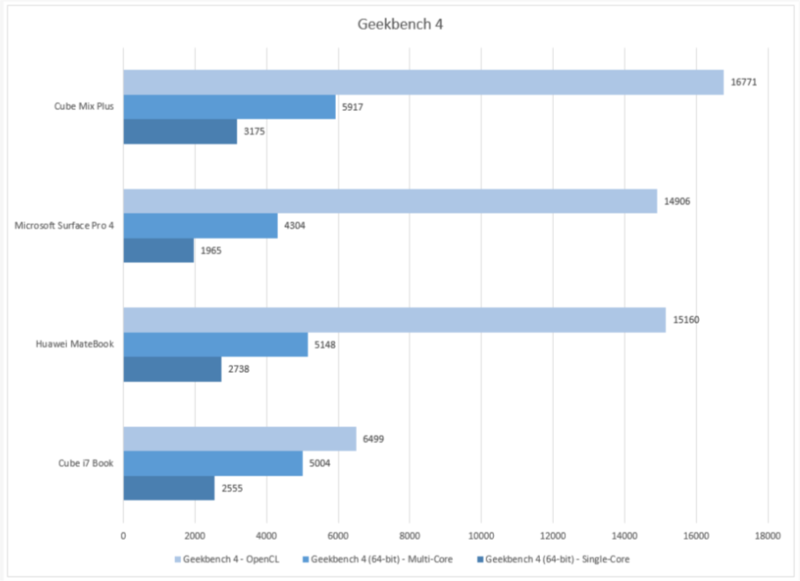 These excellent benchmark results bode very well for other Kaby Lake devices on the horizon. Hopefully that will also include a quad core tablet which we haven’t seen since the VAIO Z Canvas. Previous Cube tablets have been hobbled with 64 GB of storage, but the Mix Plus ships with a more reasonable 128 GB SSD which scored competitively with the Surface Pro 4’s drive in CrystalDiskMark tests. At the time of this writing, the Mix Plus keyboard is not available for purchase. Though the Cube Mix Plus first showed up at Gearbest.com in late December, it was immediately discounted to $400. The tablet has been pulled from Cube’s English language website, which may explain the unavailability of a keyboard. The Mix Plus was originally touted as a dual Windows/Android tablet. If mine includes Android, I have no idea how to boot into it. The bottom line is that if you’re a bit adventurous, strapped for cash, in need of a Wacom EMR sketchpad tablet and don’t mind the 10.6-inch 16:9 display, the Cube Mix Plus is an outstanding value.